The House of Deception is dedicated to the history of the deceptive arts, including magic, carnival sideshows, and pro wrestling. The three crafts have many traditions and principles in common and, in the Golden Age of Show Business, were very much alike in practice. The House of Deception is a site for those who enjoy reading about show business. We hope to encourage and facilitate the study of any performing art that employs deception, including magic, pro wrestling, and sideshow. Our bibliographies and links will guide you through a deeper appreciation of the rich traditions of deceptive entertainment and of the performers who made the magic happen. Our specialty is the rescue, preservation, and archiving of the physical artifacts of those traditions: books, photos, magazines, scrapbooks, news clips, posters, programs, letters--anything that needs and deserves special care and handling. 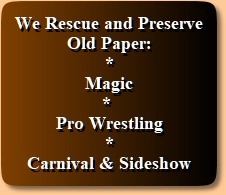 We love to rescue and preserve old paper from the bygone days of magic, professional wrestling, and circus & carnival sideshows. We use archival methods recommended by the Library of Congress. The owner and webmaster of The House of Deception is Duff Johnson, a professional magician with many years and a wide range of performing experience in closeup, stage, corporate, after dinner and nightclub entertainment, as well as magic sales. In addition, he has had a lifelong appreciation for the world of carnivals, sideshow, and professional wrestling performance, especially with their use of crowd psychology. He is an Adjunct Professor and Lecturer in Communication Studies at Sacramento City College and California State University, Sacramento. Screen Actors Guild (Eligible). Magic Collectors Association (1968-2010). Cauliflower Alley Club (Life Member). The Invisible Lodge International (Life Member). Sacramento Dog Training Club (Life Member). American Dove Association (since 2009).